"Jeannie Cho Lee" has rated the wine "Poderi Aldo Conterno Bussia Cicala, Barolo DOCG, Italy" the vintage 2008 on 13.12.2012 with 94 of 100 points.
" Excellent Barolo with an incredible intensity of flavours that range strawberries, cherries to herbal and spicy notes. The firm, ripe tannins will enable it to age for decades. The best Conterno 2008 Barolo among 3 tasted side by side (others were Bussia and Colonnello). Tasted in: Hong Kong, China. Maturity: Young. " "Doctorwine" has rated the wine "Poderi Aldo Conterno Bussia Cicala, Barolo DOCG, Italy" the vintage 1978 on 25.06.2012 with 86 of 100 points.
" The bottle offered to us up on stage was a bit tired. The color was a dark garnet, the aroma of dried mushroom and glutamate, a bit concealing and leaning toward oxidized. The taste was better, with tannins that were still locked in and a finish that was decidedly long. " "Wine Spectator" has rated the wine "Poderi Aldo Conterno Bussia Cicala, Barolo DOCG, Italy" the vintage 2012 on 30.04.2017 with 93 of 100 points. "Wine Enthusiast" has rated the wine "Poderi Aldo Conterno Bussia Cicala, Barolo DOCG, Italy" the vintage 2013 on 09.01.2017 with 96 of 100 points. "Falstaff Magazin" has rated the wine "Poderi Aldo Conterno Bussia Cicala, Barolo DOCG, Italy" the vintage 2012 on 25.11.2016 with 96 of 100 points. "Wine Enthusiast" has rated the wine "Poderi Aldo Conterno Bussia Cicala, Barolo DOCG, Italy" the vintage 2012 on 10.01.2016 with 90 of 100 points. "Wine Spectator" has rated the wine "Poderi Aldo Conterno Bussia Cicala, Barolo DOCG, Italy" the vintage 2011 on 31.12.2015 with 93 of 100 points. "Falstaff Magazin" has rated the wine "Poderi Aldo Conterno Bussia Cicala, Barolo DOCG, Italy" the vintage 2011 on 27.11.2015 with 94 of 100 points. "Wine Enthusiast" has rated the wine "Poderi Aldo Conterno Bussia Cicala, Barolo DOCG, Italy" the vintage 2011 on 10.01.2015 with 93 of 100 points. "Wine Spectator" has rated the wine "Poderi Aldo Conterno Bussia Cicala, Barolo DOCG, Italy" the vintage 2010 on 15.12.2014 with 98 of 100 points. "Falstaff Magazin" has rated the wine "Poderi Aldo Conterno Bussia Cicala, Barolo DOCG, Italy" the vintage 2010 on 21.11.2014 with 96 of 100 points. 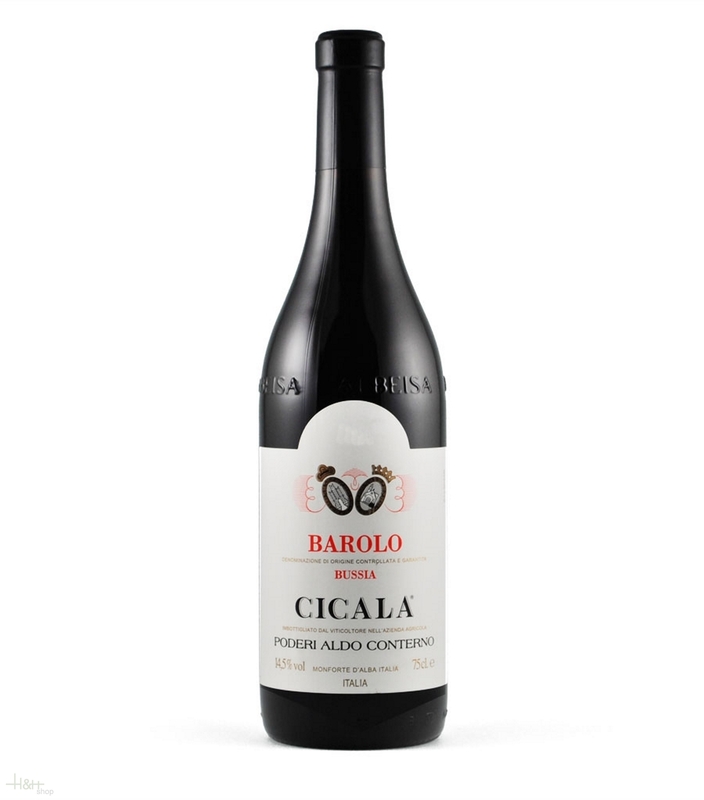 "Robert Parker The Wine Advocate" has rated the wine "Poderi Aldo Conterno Bussia Cicala, Barolo DOCG, Italy" the vintage 2010 on 01.07.2014 with 97 of 100 points. "Wine Enthusiast" has rated the wine "Poderi Aldo Conterno Bussia Cicala, Barolo DOCG, Italy" the vintage 2010 on 10.01.2014 with 95 of 100 points. "Wine Spectator" has rated the wine "Poderi Aldo Conterno Bussia Cicala, Barolo DOCG, Italy" the vintage 2009 on 31.12.2013 with 94 of 100 points. "Falstaff Magazin" has rated the wine "Poderi Aldo Conterno Bussia Cicala, Barolo DOCG, Italy" the vintage 2009 on 22.11.2013 with 98 of 100 points. "Wine Spectator" has rated the wine "Poderi Aldo Conterno Bussia Cicala, Barolo DOCG, Italy" the vintage 2008 on 28.02.2013 with 95 of 100 points.